Or stream from this page via the embeds below. And if you enjoy the show, please consider leaving a review on iTunes, and sharing the link with people you know. 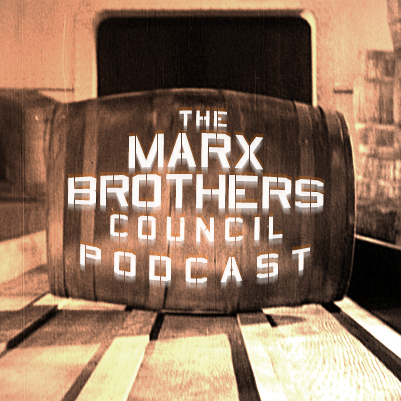 We hope you're pleased with this introductory installment of The Marx Brothers Council Podcast, or at the very least, we hope you don't dislike it too much. 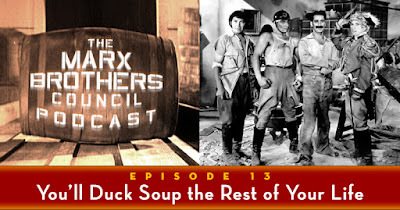 Either way, express your opinions, share what you'd like to hear in future episodes, and make disparaging remarks about the hosts in the comments section of this post, or on Facebook at The Marx Brothers Council. THAT was a wonderful opening episode! For the next installment, I plan to actually listen. Well.... maybe. Great podcast. I look forward to future episodes. I, too, have tried to rank the films. I have found that once you get past #10 the others all rank equally (Room Service, At the Circus, Big Store). Great first episode! It was worth every penny I paid to listen. It was almost as brilliant as "Skidoo"! Enjoyable stuff, it felt like three people sitting in convivial surroundings discussing their favourite subject, which is, of course, what it was. Some of the views aired I found myself nodding at your sagacity and some I heard with positive outrage, failing to understand how you could so blatantly miss the point. I hope you haven't run out of things to say and I'm looking forward to hearing Joe Adamson on the Marx Brothers. I've missed that green chap with blue hair! I write to him twice a week. Wonderful to hear you fellows. Reminds me of the mid 1970's when we stayed up all night to discuss and hash out all the points of topic you brought up...bravo! Looking forward to more. Excellent work by these 3 mavens. Just when you thought that you knew everything about the Marx Brothers, along comes this informative podcast. Can’t wait for the episode 2. I'm not going to put "Room Service" and "Love Happy" in this ranking because they are such outliers that it's not fair to compare them to the others. Let's just say that they are worthwhile for the Marx fan who knows what to expect...and I enjoy both, particularly "Love Happy". Great job of starting broadly and leaving yourself room to deal with the minutiae later. I do have to disagree about one thing -- I have a strong sentimental attachment for Lydia as Groucho enjoyed performing it later in life. Go Gazoo. 1) I was thrilled that you all hold Animal Crackers in such high esteem. It’s my fav and I’ve grown accustomed to it being passed over in favor of DS and ANATO. 2) I enjoy At The Circus and was surprised that it was so low on your collective lists. 3) One of the high points of A Day at the Races worth mentioning is the physical genius Groucho displays when he falls in the chair having dinner with Esther Muir. Also bravo (was he another brother?) on The Annotated Marx Brothers! Thanks and I’ll be listening in for sure. Also a great show. Looking forward to more.